Langsam geroestete Kirschtomaten mit Ingwer und Knoblauch sind eine wunderbare Kombination und zusammen mit hausgemachtem Labne der perfect Match! 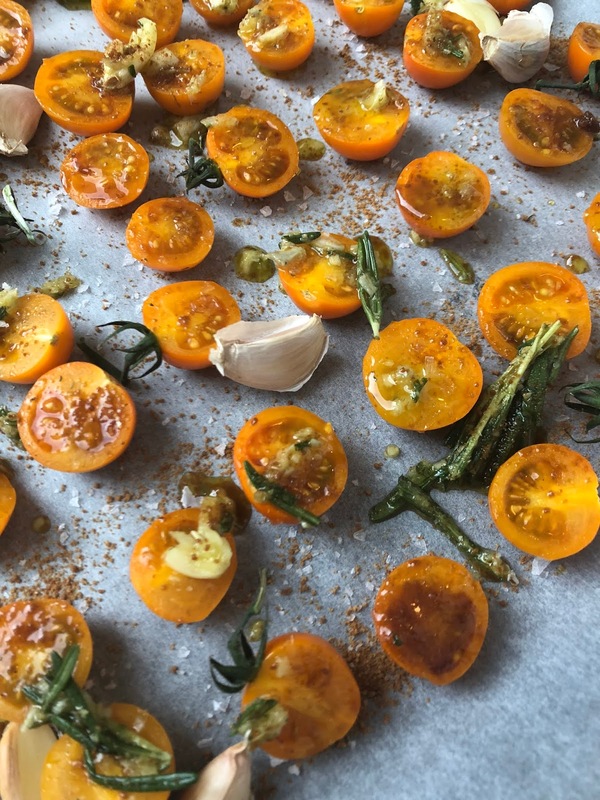 Slow roasted tomatoes with ginger and garlic are a match made in heaven and even better with some homemade labne. Slow-roasted, also langsam geroestet, klingt langweilig? Ist es nicht. Wenn ihr erst einmal diese Kirschtomaten probiert habt, die beim Backen ganz weich und suess werden und sich geschmacklich perfekt mit dem Knoblauch und dem Ingwer verbinden, dann wollt ihr nie wieder etwas anderes essen. Ihr koennt sie dann direkt aus dem Einmachglas essen, mit dem Olivenoel aus dem Glas auf einer Scheibe getoastetem Sauerteigbrot platzieren, oder so wie ich mit selbstgemachtem Labne als Vorspeise servieren. Slow-roasted sounds lame? Believe me, it's not. 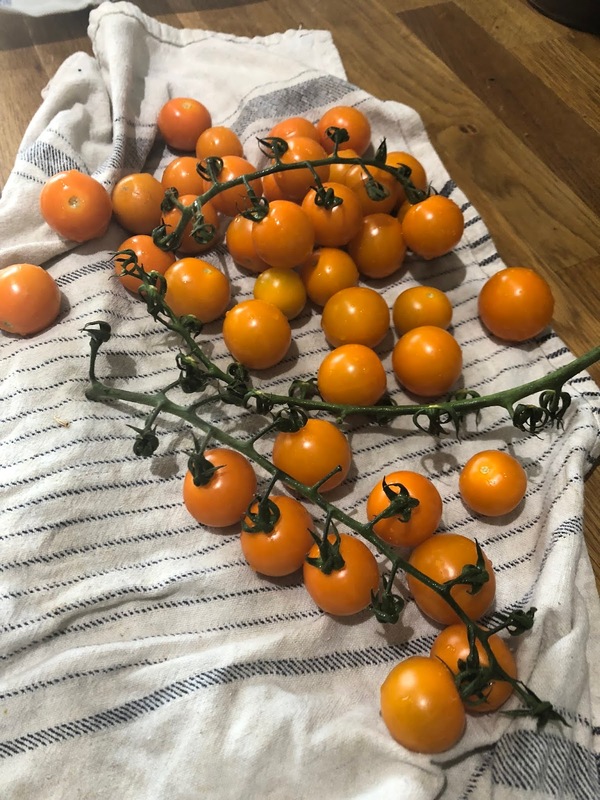 Once you've tried these cherry tomatoes that release all their sweet juices during the roasting process and mix with the fresh taste of ginger and intense flavour of garlic, you'll make them over and over again. You can them just eat them straight from the jar, put them on a slice of toasted bread along with the oil from the jar, or as I did, make some Labne and serve as a starter. 1. Ofen auf 150C vorheizen. 2. Ein Backblech mit Backpapier auslegen und die Tomatenhaelften mit Abstand zueinander darauf auslegen. Mit 3 EL Olivenoel betraeufeln und geschnittenen Knoblauch, Ingwer, Rosmarinblaetter, braunem Zucker und Meersalzflocken bestreuen. Die ungeschaelten Knoblauchzehen in den Ecken und Zwischenraeumen platzieren. Fuer 1.5 Stunden im Ofen roesten. 4. Tomaten aus dem Ofen nehmen und kurz abkuehlen lassen. Den Knoblauch von der Haut loesen und vorsichtig, abwechselnd mit den Tomaten, den Fetawuerfeln und dem zusaetzlichen Rosmarin in das Einmachglas geben. Wenn alles im Glas, oder euer Glas voll ist, mit Olivenoel auffuellen, bis alle Zutaten damit abgedeckt sind. Keine der Zutaten sollte an der freien Luft sein. Dicht verschliessen und abkuehlen lassen. Fuer ca. 3 Wochen im Kuehlschrank ruhen lassen. 5. Wenn ihr das Glas aufmacht, halten sich die Tomaten ca. 1 Woche, eventuell etwas laenger. 6. 24 Stunden bevor ihr die Tomaten servieren wollt, ein Sieb mit zwei ineinader gesteckten Kaffeefiltern oder einem Kuechenhandtuch auslegen und den Yoghurt hineingeben und abdecken. Im Kuehlschrank ueber Nacht stehen lassen. 7. Mit einem Loeffel etwas von dem Labne auf einen Teller geben und einen kleinen Wirbel erzeugen. Einige Tomaten und den Feta in diesen Wirbel geben und mit extra Olivenoel aus dem Glas betraeufeln. Etwas geroesteten Knoblauch dazugeben und mit getoastetem Sauerteigbrot servien. 2. Line a baking sheet with parchment paper and arrange tomato halves on it with some distance to each other. Drizzle with 3 tbsp of olive oil and distribute chopped garlic and ginger on top of the tomatoes, along with the rosemary leaves, brown sugar and sea salt flakes. Arrange the unpeeled garlic cloves in some corners and spaces between the tomatoes. Roast for 1.5h in the oven. 3. Sterilize a pickling jar. 4. Take tomatoes from the oven and let cool a bit. 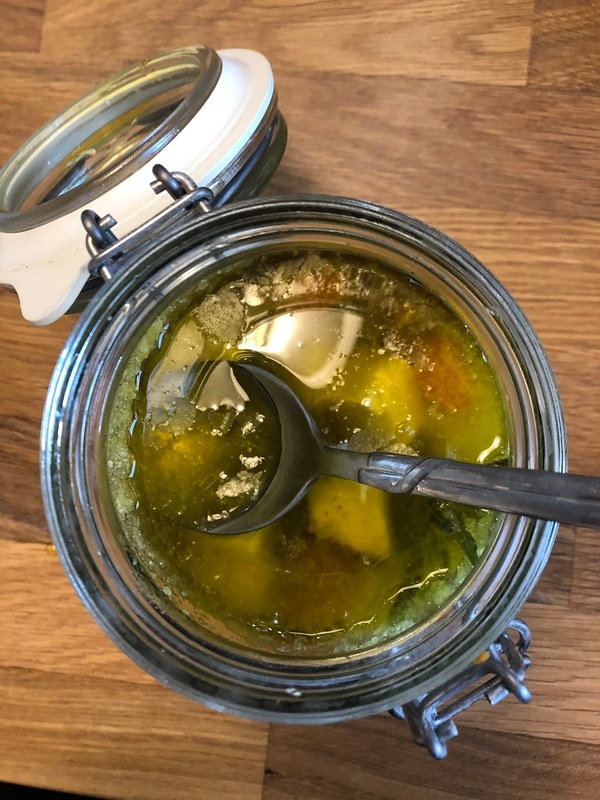 Dissolve the roasted garlic from its skin and carefully fill it together with the roasted tomatoes, the feta and the additional rosemary sprigs into the jar, alternating and creating layers. When everything is in the jar, or the jar is full, pour in olive oil until all the ingredients are covered with it. Nothing should be "outside in the air". Close tightly and let cool. Put into fridge and let infuse for 3 weeks or so. 5. After opening the jar you can eat the tomatoes for a good week, maybe a bit longer. 6. One night before serving line a sieve with two coffee filters tucked into each other or a kitchen cloth and fill in yoghurt. Cover, put in fridge and let drain overnight. That's it, that's your labne. 7. Spoon some of the labne onto a plate and create a small swirl into which you'll put the tomatoes and the feta cheese and some of the roasted garlic. Drizzle with oil from the jar. Serve with some toasted sourdough bread and the world is yours!